"the trebuildulations of a server"
What started with warning about disk space, turned into a complete server rebuild which occupied all of my free time this week. I’m writing down some of the issues for the benefit of my future self and others. When I see a disk space warning, I head into the drive and look for things to delete. In this case, I immediately noticed Windows.old taking up 15GB – this remnant of the upgrade to Server 2012 R2 last year was ripe for removal. If this were Windows 7, I would run Disk Cleanup but on Server that requires the Desktop Experience feature to be installed. It isn’t by default and can’t be removed once it is. So, I set about trying to remove the folder at the command line. At this point, it seems I failed to remove the junctions from Windows.old but succeeded in taking ownership, resetting permissions and removing the folder. The folder was gone but all was not well. On restart, the Hyper-V management service wouldn’t start. I forget the error but I eventually determined that the permissions had been reset on C:\ProgramData\Application Data. Unrestricted by folder permissions, Windows links this folder to itself resulting in C:\ProgramData\Application Data\Application Data\Application Data\Application Data\Application Data... This causes lots of MAX_PATH issues at the very least. Despite correcting the permissions, I wasn’t quite able to fix everything and Hyper-V continued to fail. A rebuild was in order. Microsoft have refined the Windows Server installation process over the years so that it is now normally relatively painless, even without an unattended install. Boot from a USB key containing the installation media, select some localisation options, enter a licence key and off it goes. Not this time. We couldn't create a new partition or locate an existing one. For more information, see the Setup log files. This foxed me for a while. I tried DISKPART from the recovery prompt, I tried resetting disks to non-RAID and I tried disabling S.M.A.R.T. in the BIOS. Nothing worked. I did notice mention of removing USB devices and disconnecting other hard drives suggesting there’s some hidden limit on the number of drives or partitions that the installer can handle. I could have removed each of the three data drives one by one to see if that theory had merit but I decided to jump in and remove all three. Success! A short while later I had a working Windows Server 2012 R2. I reconnected the three data drives and now came time to see if Storage Spaces would come back online as promised. The disks were back online and the data was available. Great! This was a short-lived success story – the disks were offline after reboot and had to be re-attached. Thankfully, I was not alone and a PowerShell one-liner fixed the issue. I thought I’d take the opportunity to switch my imperative PowerShell setup scripts for Desired State Configuration-based goodness. This was a pretty smooth process but there was one gotcha. DSC takes care of silent MSI installations but EXE packages require the appropriate “/quiet” arguments. The result of missing arguments in my configuration script meant that DSC sat waiting for someone to click an invisible dialog box in the EXE’s installer. return before SendConfigurationApply can be invoked. The issue even survived a reboot. Again, I was not alone and some more PowerShell later, my desired state is configured. I’m pleased to report the server is back to a happy state and all is well in its world. I’ve been automating the configuration of IIS on Windows servers using PowerShell. I’ll tell anyone who’ll listen that PowerShell is awesome and combined with source control, it’s my way of avoiding snowflake servers. Why is this happening? The problem is intermittent so it’s difficult to say for sure but it does seem to occur more often if the IIS Management Console is open. My theory is that if the timing is right, Management Console has a lock on the config file when PowerShell attempts to write to it and this error occurs. I'm now blaming AppFabric components for this issue. I noticed the workflow service was accessing the IIS config file and also found this article on the IIS forums - AppFabric Services preventing programmatic management of IIS. The workflow services weren't intentionally installed and we're using the AppFabric Cache client NuGet package so I've removed the AppFabric install completely and haven't had a recurrence of the problem. I’ve been using the ASafaWeb security analyser to scan various websites that I work on. It picks up basic configuration problems in .NET websites and, very handily, will scan periodically to make sure that misconfiguration doesn’t creep back in. ASafaWeb was created by Troy Hunt, a software architect and Microsoft MVP for Developer Security based in Australia. Troy writes some great articles on improving application security, with a focus on .NET, and he links to those articles in ASafaWeb to illustrate why and how improvements should and can be made. 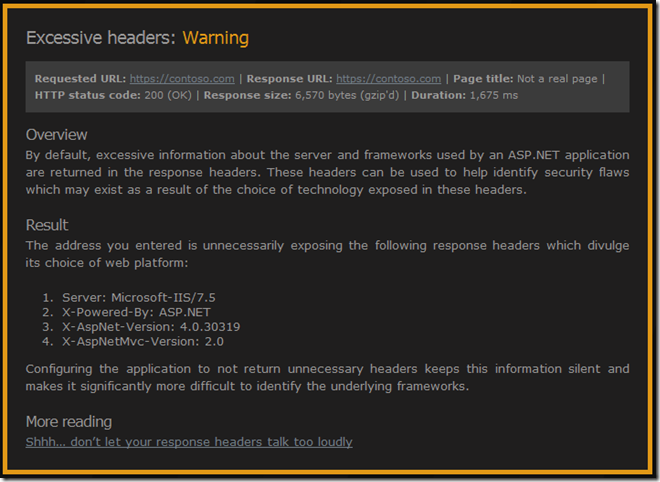 See that “X-Powered-By: ASP.NET” header? That one’s inherited from the IIS root configuration. We could remove it in every web.config but better to remove it once. 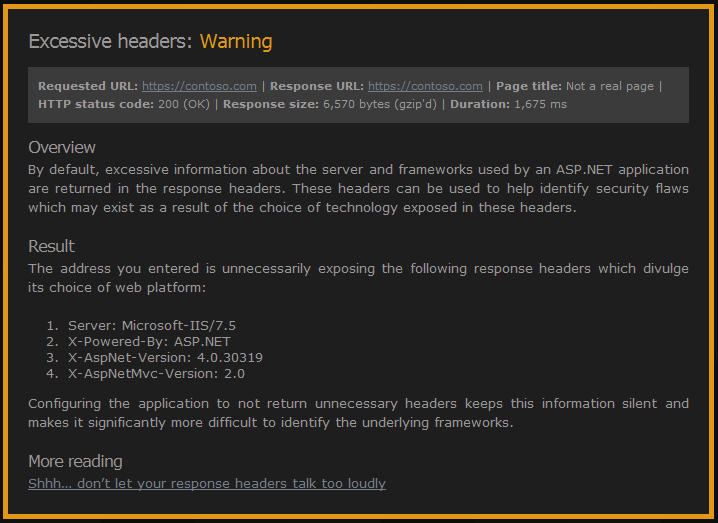 Troy links to his blog post on removing all of those headers – Shhh… don’t let your response headers talk too loudly. As he mentions, there are many different ways of removing those headers – he goes into IIS Manager UI and removes it from there. I’m trying to make sure that I script server configuration changes. This is a great way of documenting changes and allows new servers to be configured simply. I want servers that can rise like a phoenix from the metaphorical ashes of a new virtual machine rather than having fragile snowflake that is impossible to reproduce (thanks to Martin Fowler and his ThoughtWorks colleagues for the imagery). So, the script to remove the “X-Powered-By” header turns out to be very straightforward once you figure out the correct incantations. This assumes you have Powershell and the Web Server (IIS) Administration Cmdlets installed. That’s a lot of words for a very little configuration change but I wanted to talk about ASafaWeb and those ThoughtWorks concepts of server configuration. I also need to mention my mate Dylan Beattie who helped me out without knowing it. How? StackOverflow of course. I'm a software developer/technical architect working for a logistics company in the UK.